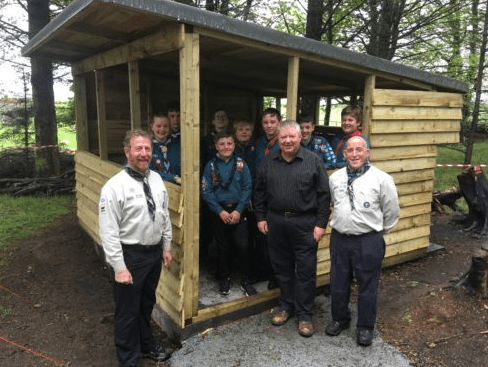 A scout hut which was deliberately torched last summer has been replaced thanks to the generosity of Highland Games organisers. Vandals targeted the hut at the Daviot camp site, near Inverurie, on July 2, disappointing all those who have used it over the years. The shelter was one of eight used for camping by the entire Gordon District and would have cost the Scouts about £1,000 to replace. That might have proved difficult to find in the short term had it not been for the organisers of Oldmeldrum Sports. When they heard of the Scouts’ plight, they decided to step in and hand over the money needed – not least because the Daviot scouts volunteer at the games every June by helping guide people in and out of the car park. Doug Petrie, chairman of the committee, said: “We have been helped by the Daviot and Oldmeldrum scout troop for many years and when we heard about the senseless damage at the campsite we saw this as an opportunity to repay their support. “The campsite is used by scout troops from across the area, but the local scouts are the main users”. In the meantime, the site’s warden Terry Will – a joiner by trade – was joined by volunteers and the scouts themselves to build a new hut. This will allow the group to put much of the money they would have spent on a replacement towards refurbishing the site’s shower and toilet block. Keith Millar, district commissioner, said the support from Oldmeldruum Sports was a huge boost to the scouts. He said: “We have spent a considerable amount of money on developing the site for use of the district scout group to provide a wide range of activities for all the beavers, cubs and scouts. “Having to replace one of the huts following a mindless act of vandalism was an unforeseen cost that takes away from some of the other developments we are undertaking. “We are grateful for the financial help the sports committee have given us.